40mm Everose Rolesor case comprised of a 904L steel monobloc middle case, screw-down steel back, screw-down Everose gold crown with triplock double waterproofness system, bidirectional rotatable 18K Everose gold bezel with polished raised numerals and graduations, scratch-resistant sapphire crystal with cyclops lens over the date and double anti-reflective coating, black dial, pink gold applied hour markers with Chromalight blue luminescence, Rolex calibre 3135 automatic movement, approximately 48 hours of power reserve, Everose Rolesor Oyster bracelet comprised of a combination of 904L steel and 18K Everose gold in flat three-piece links, Oysterlock folding safety buckle with Easylink 5mm comfort extension link. Waterproof to 100 meters. Introduced at Baselworld 2016. 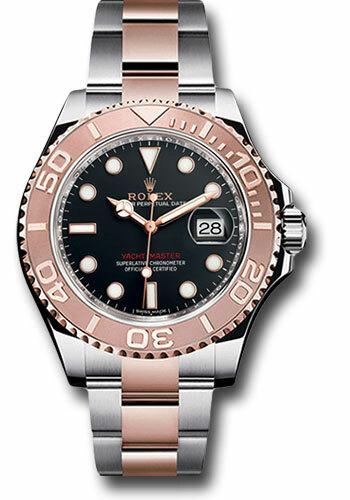 40mm Everose Rolesor case comprised of a 904L steel monobloc middle case, screw-down steel back, screw-down Everose gold crown with triplock double waterproofness system, bidirectional rotatable 18K Everose gold bronze bezel with polished raised numerals and graduations, scratch-resistant sapphire crystal with cyclops lens over the date and double anti-reflective coating, brown chocolate dial, pink gold applied hour markers with Chromalight blue luminescence, Rolex calibre 3135 automatic movement, approximately 48 hours of power reserve, Everose Rolesor Oyster bracelet comprised of a combination of 904L steel and 18K Everose gold in flat three-piece links, Oysterlock folding safety buckle with Easylink 5mm comfort extension link. Waterproof to 100 meters. Introduced at Baselworld 2016.